North-east meat processor McIntosh Donald was bought over by Kepak in August. Gemma Mackenzie caught up with the site’s new manager to find out about his plans for the future. McIntosh Donald’s new owners intend to increase the number of cattle and lambs slaughtered at the Portlethen site every year. The abattoir and boning plant on the outskirts of Aberdeen was bought by Kepak Group in August. The acquisition by one of Ireland’s biggest red-meat processors saw McIntosh Donald rebranded as Kepak McIntosh Donald. A new site manager has been appointed, and in a short time changes have been made to boost the efficiency and throughput of the plant. The site’s new general manager, Alan Brown, was born in Aberdeen and brought up near Dingwall. 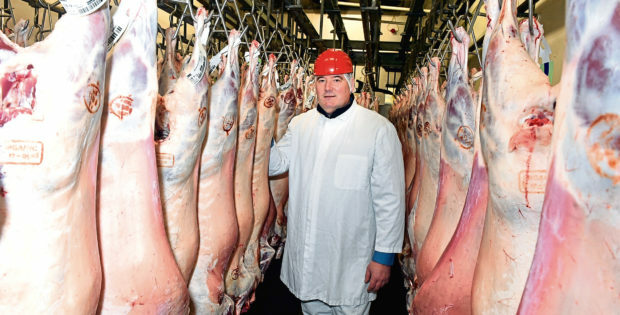 He has been in the meat trade all his working life, starting out as a slaughter and butcher trainee at John M Munro Ltd in Dingwall before moving to Buchan Meat in Turriff. He joined Kepak when it took over Buchan Meat. Following Buchan’s sale to Woodhead Bros he worked at a Kepak plant in Wakefield, near Leeds. More recently he was the group’s lamb business unit director in Ireland. Mr Brown was drafted in to work at McIntosh Donald following its acquisition from 2 Sisters. The sale also included three other sites located in Wales and Cornwall. Kepak Group processes 6,000 cattle and 15,000 sheep a week in Ireland, and the purchase of the 2 Sisters Red Meat Division will result in an increased annual kill of around 5,500 cattle and 1.5 million sheep. Mr Brown said changes had been made to the staff structure at McIntosh Donald and weekly cattle kill has increased to 1,600, from 1,200 before, while prime lamb kill has doubled to 4,000 a week. “They used to run one squad to process beef and lamb but, as part of the integration, we wanted to split that and we now have a squad for each,” he said. “We want to try and lift lamb production as 60% of the lamb crop in Scotland goes outside (of the country) to be slaughtered. He said there were also plans to expand into different killing categories for cattle, in addition to prime stock, to ensure the company offers an extensive slaughtering outlet for farmers. “We are opening up our cattle supply base to make it more farmer-friendly,” added Mr Brown. He paid tribute to predecessor Alan McNaughton, who retired at the end of last year, saying he had left a “great facility” for Kepak to utilise. Mr Brown said the company would continue to source stock from farmers across Scotland, and plans were in place to increase the number of procurement fieldsmen it employs. This is in addition to an increase in staff numbers to around 360 from 270 before. “In a short space of time we have increased the workforce and split out crews,” said Mr Brown. He said integration of McIntosh Donald into the Kepak Group was opening up export opportunities, and exports of Scotch Beef and Scotch Lamb processed at the Portlethen site had already begun. An extensive staff training regime is also under way and plans are in place for “significant investment” at the site. This will include upgrades to the killing and boning lines and the creation of a farmer meeting room in the lairage and intake area. Mr Brown said the firm also plans to hold regular “live to dead” meetings with farmers to explain specifications and market opportunities.